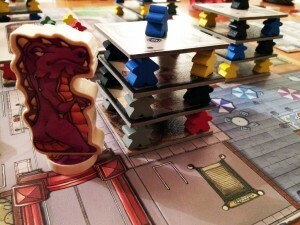 Buildings consist of layers of card floors separated by meeple of random colours. 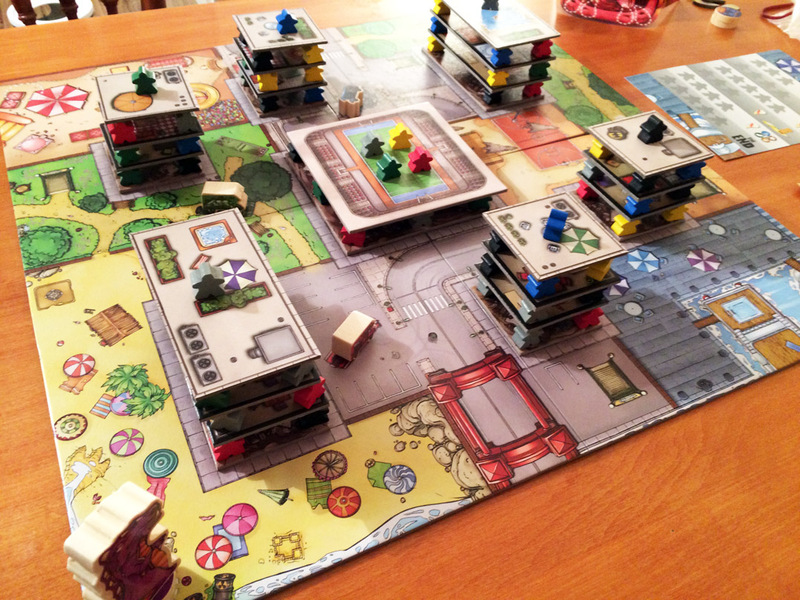 You want to knock these buildings down so you can (potentially) eat the meeple but you also take any floor sections which have nothing on them as these are worth VPs too. With just 2 actions a turn, the game moves at a good pace with some interesting outcomes as it’s surprising how some precarious buildings can suddenly be unexpectedly resilient or how meeple can fall in unexpected directions. It’s a physical game too so don’t expect to be sitting down all game as you need to keep moving around the table to have the correct angle to flick things. Any meeple that fall off of the board are placed on the Runaway Board. If a row on the Runaway Board is filled then the monster that caused that suffers whatever penalty the runaway board describes. The Runaway Board is double-sided with different layouts as this adds some nice extra variety in replay – 0n one side, the rows fill up just through total number of meeple, whereas on the other side the rows fill-up based on the colour of the meeple. The game ends when either the final floor is taken (and can end when the Runaway Board fills up if using side A). VPs are scored for each set of the 6 different colour meeple, for building floors, for opponent’s teeth, and for each monster’s character card. Players are each given a character card at the start of the game which describes how they can score extra VPs, i.e. 10VPs for eating more yellow meeple than any other player, 10 VPs for destroying more building floors, 3VPs for each pair of grey and black meeple, etc. Knowing how each other’s monsters will score these extra VPs (as they read out their character cards at the start of the game) is a very good rule as this allows player to help themselves and/or hinder others, rather than work in the dark. At the start of the game, players also each have a power card (an unlimited use special ability which they reveal at the start) and a super power card (a one-use special ability which they keep secret). I really liked the different powers as they make each monster different and there was a lot of imagination in their variety. However, it seemed that some were more powerful than others – I know Rampage is just a bit of fun but too much imbalance can be annoying. One rules variant allows players to draw 3 of each card and keep 1 of each, but I’d have liked it to go a bit further than that so that it’s not always the most powerful ones that get used; for example, the more powerful powers could be weighted by having a VP cost on them. To attack a building, a monster’s disc needs to be very close to the building’s base (shown by a coloured border around each building’s base) and I was surprised how tricky this could be – if you hit the building’s base too hard, the disc bounces off and ends too far away. So, there is more skill to the movement flicking than it first appears, but you do get a feel for the power required after a while. I did have one thought that it would have been nice to have included a second border around buildings which is further out than the first. This easier border could be used by players who are not as skilled in their flicking (especially young players), plus it would create a good handicapping system so skilled and less-skilled players could still compete directly. As eaten meeple remain hidden behind your screen and you score VPs for sets of meeple (plus maybe more from your character card), you definitely feel the need to try and disguise which colours you’re trying to collect to complete a set, especially if there aren’t many left on the board (which is a nice extra bit of tension). It’s a bit disappointing if there aren’t any meeple left in the city to be eaten which can benefit you, but you can still aim for VPs by attacking monsters, gaining building floors, and maybe eating meeple your opponent(s) may need. Physically, the game looks great with chunky monster pieces, think card building floors, loads of meeple and a colourful board. With 16 character cards, 16 power cards and 16 super power cards, there’s a decent amount of variety in replay especially as these give lots of different combinations, plus the colours of meeple in each building are random. There are few nice variant rules too. I especially like the -1VP for each meeple you eat that isn’t part of a set at the end of the game as it adds a bit more decision-making to the game. Overall, Rampage delivers exactly what you would expect from its description – a fun, chaotic game of destruction. Flicking discs, destroying buildings, giant monsters – what’s not to like about that? 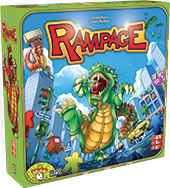 This entry was posted on Friday, April 11th, 2014 at 4:31 pm	and is filed under Board Game Review, Board Games, Essen Spiel 13, Rampage, Spiel 2013. You can follow any responses to this entry through the RSS 2.0 feed. You can leave a response, or trackback from your own site.